Surf Scoter – Surf Scoter taken by Benny Spies off Deal Island, Md. A custom wall mount diorama in a frame. Dock line was unwound and re braided onto a custom welded steel rod. Muscle shells were added to the line for a natural looking mount. 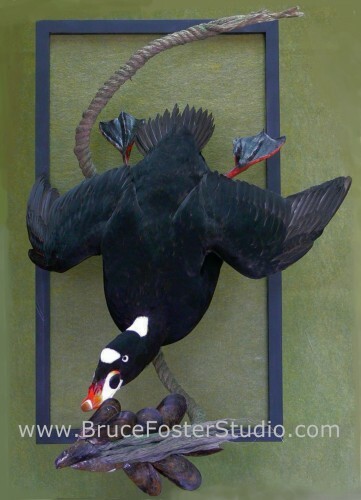 As with all my bird mounts, a hand wrapped body, custom bill and injected feet are standard in my mounts.